Product Detail Summary: Play, store and take it with you wherever you go! 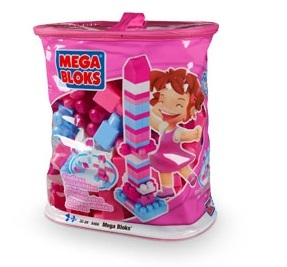 The 80-piece MEGA Bloks Pink Bag includes 80 big building blocks in a girl-themed “Pink” color scheme. It is the perfect toy for your little girl who is just learning how to create with her own two hands. Give her the opportunity to stimulate her imagination and learning skills while encouraging discovery, fine motor skills and open-ended play. The practical pink storage bag keeps all of the pieces securely in one place and comes with a hand-strap to make carrying the blocks a snap! Ideal for children 1 year old and up!